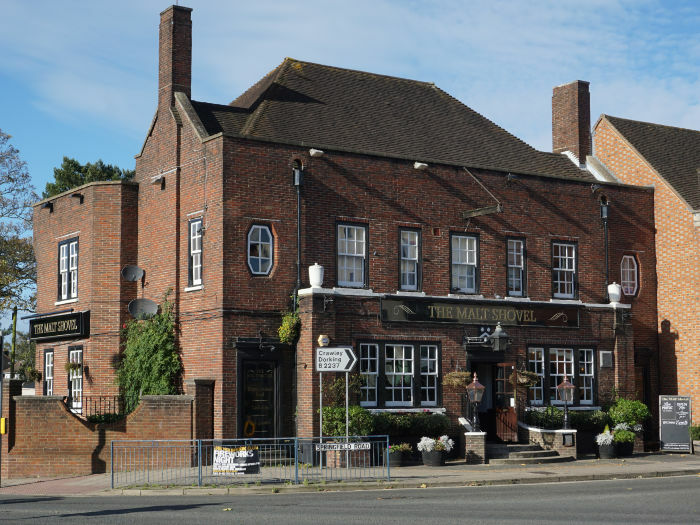 The Malt Shovel (on Twitter) is a large red-bricked building on the corner of Albion Way and Springfield Road. There's a car park and small seating area at the rear. The bar area has flagstone floors and wood panelling. The pub has six real ales on tap and they usually include beers from Sussex-based and other nearby breweries, for example Surrey Hills Brewery, Downlands Brewery and Long Man Brewery. It's great to have a choice of ales that aren't usually available elsewhere in Horsham. The Downlands Brewery Old Ale was excellent when I was there. It's a bit unusual these days but the pub serves beer in jugs (dimple glasses) and straight glasses. Ask at the bar if you have a preference for straight glass. The pub has live music on a Saturdays and regular open mic nights. The pub was originally called the Michell Arms after the family that built it. A pub crawl that includes the Malt Shovel, the Anchor Tap and the King's Arms will probably give you the widest choice of ales in Horsham.